Private Detective Tom Conway is hired by jeweller Mercedes to investigate the theft of jewels from a London fashion house. 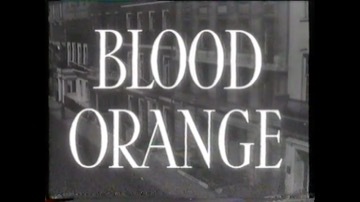 But things take a sinister turn when two women, model Chelsea and the elderly Lady Marchant, are murdered, both while wearing a newly designed dress called “Blood Orange”. Conway suspects there must be a connection linking the crimes. For some reason, Tom Conway, who was the brother of fellow actor George Sanders, plays a character in this film called – Tom Conway! This was his only feature for Hammer, although he later narrated the featurette “Copenhagen” (1956) for them. In the 1940’s he acted in horror films for RKO producer Val Lewton, such as “Cat People” (1942), “I Walked with a Zombie” and “The Seventh Victim” (both 1943), as well as playing the detective character ‘The Falcon’, a part he inherited from his brother, in a series of second features also for RKO. In 1956, he appeared in the Grade-Z American International schlock horror movies, “Voodoo Woman” and “The She-Creature”.